Elegant and simple to use, the BV-10 offers precision beveling of micropipette tips between 0.1 and 50um. The unique abrasive plate drive system is vibration free for greater control of the beveling process. Beveling can be accomplished very rapidly and produces consistent tip diameters using the techniques as described by Brown and Flaming, Science, August 1974, Vol. 185. Intracellular recording electrodes can benefit from beveling because of 1) a reduction in the tip diameter by creation of the sharp point on the electrode and 2) a lowered electrical resistance of the electrode due to the larger cross sectional area of the lumen. This greatly facilitates penetrating and holding very small or difficult cells. Microinjection needles also benefit from beveling by promoting entry into cells with minimal damage while at the same time enhancing the flow of material through the needle. The basic beveling system consists of a stationary pedestal, optically flat to a half wave (250nm), surface mounted on a heavy baseplate. This serves as a bearing for an abrasive coated glass grinding plate, which is also flat to half a wave. The flat abrasive plate is coupled to a low vibration, slow-speed motor by means of magnetic fields to provide a wobble-free flat grinding surface. The abrasive plates are fabricated with a proprietary process which insures a consistent abrasive coating. A 2-stage micromanipulator holds the pipette to be beveled and permits controlled advancement onto the abrasive surface. The bevel angle and speed of advancement are adjustable. A halogen lamp with a gooseneck enhances the beveling operation by providing sharp illumination of the abrasive plate and pipette. Two options are available for monitoring the beveling process, an 80X, stereo microscope and an electrode impedance meter. Depending on your research application, one or both of these options may be desirable. 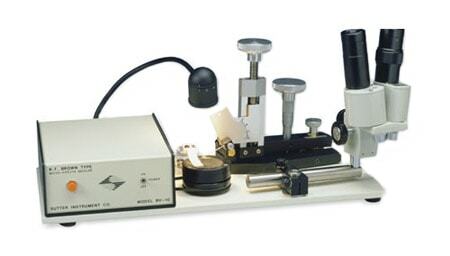 For all micropipette applications, the swing mounted microscope enhances your control of pipette advancement onto the abrasive plate and allows for viewing of the beveling operation (scope resolution is not sufficient for viewing the actual bevel except in the case of very large tips). For microelectrode applications, the impedance meter is used to monitor the tip resistance during the beveling operation. The meter is an analog design, offering three resistance ranges (0-10, 0-100, 0-500 MOhm). Measurements are made at 12 Hz to minimize capacitive contributions to the impedance measured and provide a near-true DC resistance value. A rapid roll-off is used to reduce 50/60 Hz interference, allowing operation in a laboratory environment without screening. Vibration-free, magnetically coupled beveling surface. Abrasive surface optically flat to a half wave (250nm). Finest abrasive surface commercially available. Synchronous clock motor insures stable rotation rate. 7lb steel baseplate adds additional dampening. Robust micromanipulator controls bevel angle and advancement.